Click here for a sample of ANC037. I am holding myself in my abdominal cavity. / I am happy I am not speaking. / This morning I looked at the sun. / I am okay with it I think. / My head is large but not unwieldy. / I think you are better than me. Although it was developed as a healing approach for children, neuroscience has found the practice of play therapy to be similarly beneficial for adults. Through modalities as varied as nature play or storytelling, individuals reduce negative cognitive behaviors, allowing them to comfortably address grief, anxiety, depression, and more. 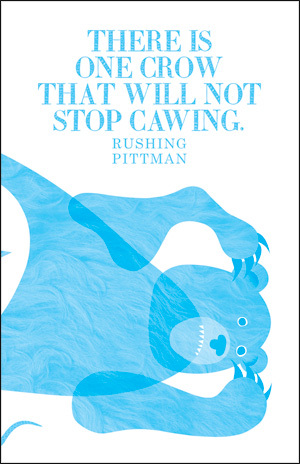 The poems in Rushing Pittman's There is one crow that will not stop cawing. employ an absurdist perspective in their examination of death, the limits of the body, the acceptance of infertility, loss in love, the human soul and the soul in all things. Also explored are the constant flux of our multiple identities and the conversations in which they engage. Ultimately, the collection handles lightly these heavy concerns; the poems are tinged with hilarity as much as sadness. In short: they play. Pittman writes: I began this book on my deck at the start of spring in 2015. I was preparing to come out to my family as transgender, and my world order was shifting. I could no longer imagine my future. I barely knew what my body would look like in a year’s time, and I was unsure of who I would still have in my life. The way I got through this period was to sit on my deck and stare at my yard. I wanted to sit as still as possible and be silent. I counted the weeds. I considered making a garden. I listened to one crow cawing repeatedly. I think that eventually, as this project went on, I became very much like him.